Well, here's another from the Samuel Adams Winter variety pack, a review of the White Christmas Ale. This is a Limited Release beer, but I'm honestly not even sure it's sold in regular six-packs. It might only just be in the winter pack. I'm always amazed by how many different beers Sam Adams is able to put out. Yes, I realize they're a big brewery and not really in the microbrew category, but they do put out some awesome craft-style beers that would make a lot of microbreweries happy if they had made them themselves. This is definitely unusual for a huge brewery like Samuel Adams, but who's complaining? Anyway, the Sam Adams White Christmas Ale is an unfiltered wheat beer brewed with cinnamon, nutmeg, and orange peel, coming in at a respectable 5.8% ABV. Yes, the bitterness here is lacking at only 8 IBU's, but hops aren't really a concern in a winter-style wheat beer like this. 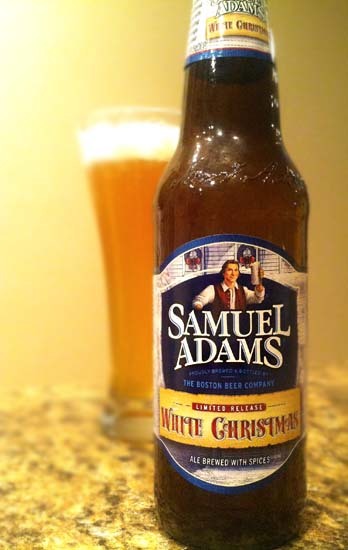 Samuel Adams White Christmas Ale pours a cloudy dark straw hay color with a quickly fading thin white head. It smells predominantly of wheat bread and nutmeg, with a vague citrus aroma that's a lot more like grapefruit than the orange peel they actually brewed it with. It is heavy and creamy in the mouth with front and center flavors of wheat bread, sweet maltiness and orange pithe, with a nondescript spiciness than difficult to pick apart, followed by a dry, bitter finish that's not unlike pouring a bunch of dry powdered holiday spices into the palm of your hand and licking them off without any type of sugar. There's no doubt about it, this is an interesting beer and I can commend that. Sam Adams isn't afraid to experiment, that's for sure. This beer is kind of sweet yet kind of savory in a weird, hard to describe way. The finish on this wheat beer is surprising and may be off-putting to some. Personally, I prefer the Old Fezziwig from Sam Adams if I want a holiday beer from their brewery, but this one isn't bad. Just an interesting twist on a holiday beer. Drink This: if you want an interesting take on a holiday beer. Don't Drink This: if you don't like spices in your beer. The finish here was surprisingly spiced and could be off-putting to a certain percentage of you. Agree! I liked this beer when I tried it and couldn't figure out why. I just liked it. Yeah, it's actually pretty tasty! A unique take on a winter brew for sure.